Wine Charms are a whimsical accessory for the stems of your glasses, they serve as an attractive way for you and your guests to ensure that your wine glasses never get mixed up. The Wine charms are not only for wine glasses but are also great for a variety of other drink glasses, such as champagne, martinis, margaritas or anything else with a long stem. 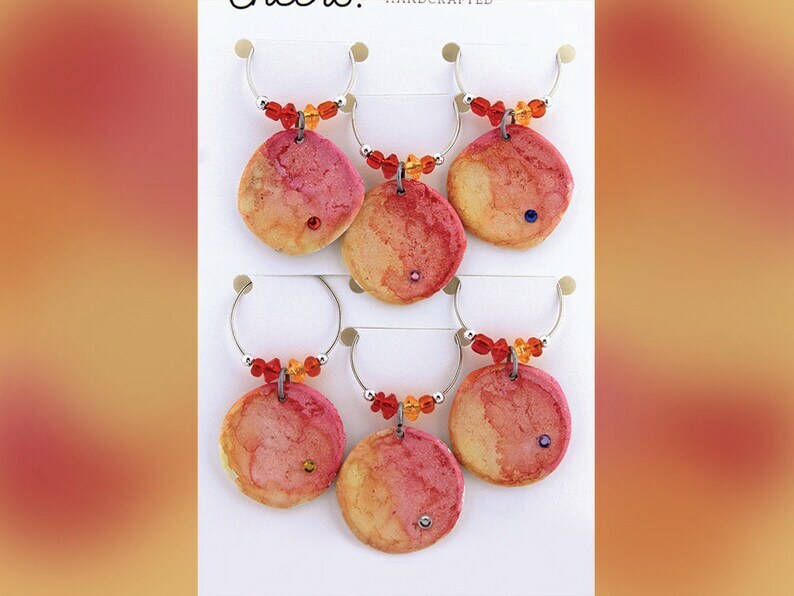 Unlike other bottle cap wine charms, these are flattened in an original way forming a medallion shape which has the perfect surface for applying a water color painting technique. These sun kissed colors invoke memories or hot summery days. The delightfulness of these charms will only be outmatched by the company putting them to use as you gather for a good time. These are a perfect accompaniment to a gift of wine for a housewarming, hostess, secret Santa or stocking stuffer gift. Given the nature of Handmade products, this is a one-of-a-kind item, like snowflakes no two are the same, though they may be similar. This item has small parts and is a choking hazard, keep out of reach of children. Thanks for stopping by and come back again soon! Be sure to become a Fan on Facebook http://www.facebook.com/turtlenotes or follow our blog https://helloturtlenotes.wordpress.com to be kept posted on new products and other Turtle Notes news. Copyright © Kelly Street All Rights Reserved. The digital scrapbook paper was exactly what I was looking for...beautiful design...ty. Lovely magnets, and perfect for that little something extra. Very happy with these papers. Great quality. • I am currently participating in Direct Checkout which allows you to pay directly with your credit card without going through Paypal. This option is available for those who are unable to pay through Paypal. • If your item has arrived damaged, please notify me immediately. In most cases a full refund or replacement will be issued. • No refunds on digital items, and no returns since it isn't possible t return an item already downloaded, all sales are final. Send me a message, if you are having difficulty with the files (such as downloading, unzipping, or opening the files), I will do my best to get back to you and help within 24 hours. Usually a quick google search stating your issue or question will help you out too. I cannot do anything about printing issues. • Items will be shipped within 1-3 business days of purchase (orders placed before 12PM PST weekdays often ship the following morning!) via First Class mail. • Digital items will be available for download through Etsy once payment has been accepted. Files are bundled into a zip folders for easy upload and download. So if accessing files on tablet or mobile device you will need an app to unzip files. • For digital items, they are bundled in zip files. To unzip, mac double click on zipped file and new folder will appear, pc right click on zipped file select 'extract' from pop-up menu. • If accessing files on tablet or mobile device you will need an app to unzip files.